Access: Open Access (the full text of each article published is freely available to all readers). Fees: There are no submission or publication fees in our journal. An article submission and its processing, i.e. peer-reviewing, editing and publishing, are free of charge for authors. Language: English (all contributions to the journal should be in English). 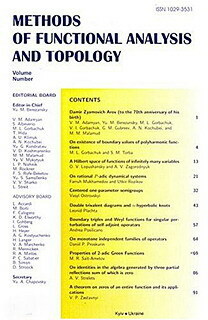 MFAT is an arXiv overlay journal publishing original reviewed articles and surveys on general methods and techniques of the functional analysis and topology with special emphasis on applications in modern mathematical physics. The papers are considered for publication if they have not been published previously and are not submitted for publication elsewhere. Based on peer-review reports, the articles are accepted or rejected by the editorial board, which contains experts in many subfields. For rapid handling, we accept submissions only online at submission page. Based on peer-review reports, the articles are accepted or rejected by the editorial board, which contains experts in many subfields. Your article can be prepared for submission in any TeX-style of your choice; initial uploads should be in PDF format. However, after the refereeing process we will ask you to prepare the paper using the MFAT style file. Bibliografical references should be listed alphabetically at the end of the article. The authors should consult Mathematical Review for standard abbrevi­ations of journals' names. All references in the bibliography should be cited in the text. not published previously and not submitted for publication elsewhere. As part of the submission process, authors are required to check off their submission's compliance with all of the following items, and submissions may be returned to authors that do not agree to these guidelines. I, the corresponding author, am authorized by all of my co-authors to submit this paper. (c) keywords and Mathematics Subject Classification for the article. The paper has not been published previously and are not under consideration for publication in any other journal or book. The article, or any part thereof, is in no way a violation of any existing original or derivative copyright. The article contains nothing obscene, indecent, objectionable or libelous. MFAT is committed to ethical standards in its editorial policy. The editors of MFAT do their best to ensure fair, unbiased, and transparent peer-review processes and editorial decisions. That means that all published articles in the journal have been contributed or will be contributed to the arXiv. In addition, the MFAT web site has hyperlinks to the arXiv copies. If a paper accepted for publication is already on arXiv, the author should provide the Editors with both the paper number and the password so that we can replace it with the typeset version. The authors retain the copyright for their papers published in MFAT under the terms of the Creative Commons Attribution-ShareAlike License (CC BY-SA).